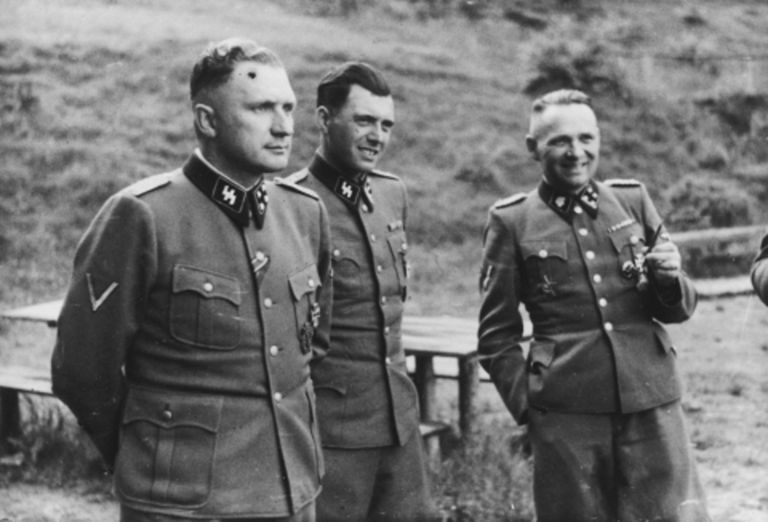 From left to right they are: Richard Baer (Commandant of Auschwitz), Dr. Josef Mengele and Rudolf Hoess (the former Auschwitz Commandant). (July 1944). Josef Mengele (March 16, 1911 - February 7, 1979) was a Nazi SS doctor who experimented on twins, dwarves, and others at the Auschwitz Concentration Camp during the Holocaust. Although Mengele looked kind and handsome, his heinous, pseudoscientific medical experiments, often performed on young children, has placed Mengele as one of the most villainous and notorious Nazis. At the end of World War II, Mengele escaped capture and is believed to have died in Brazil 34 years later. Assumed that his remains were buried in Embu, Brazil in a grave marked "Wolfgang Gerhard"
Believed to have died on February 7, 1979, on the beach at Bertioga in Embu, Brazil while suffering a stroke while swimming in the ocean. In June 1985, the body in the grave was exhumed for forensic identification.